GCA acted as financial advisor to Sumitomo Heavy Industries on the acquisition of Lafert Group, a European leader in the design and production of electric motors and drivers customized for industrial use. This transaction underpins GCA's strong cross-border capabilities and significant experience in the industrial sector. Lafert will lead, on a global scale, the sales, marketing, R&D and engineering activities for motors manufactured in its production facilities, in Italy, Slovenia and China. In 2017 Lafert Group reported a turnover of EUR 150m, with a growth of 9% on the previous year and an EBITDA margin above 10%. Sales revenues in the first quarter of 2018 are up 17% compared to 2016. The robust financials of Sumitomo Heavy Industries will support Lafert’s growth strategy and will facilitate the company in consolidating its leading position in the electric motors market. 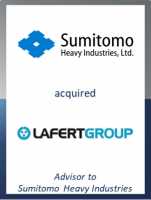 Both Sumitomo Heavy Industries and Lafert will mutually benefit from accessing new markets. The total value of the production of Sumitomo Drive Technologies’ electric motors following the acquisition of Lafert will reach EUR 250m, of which 24% is made up of brushless servomotors and torque motors, 12% is permanent magnet synchronous motors and 64% is asynchronous motors.